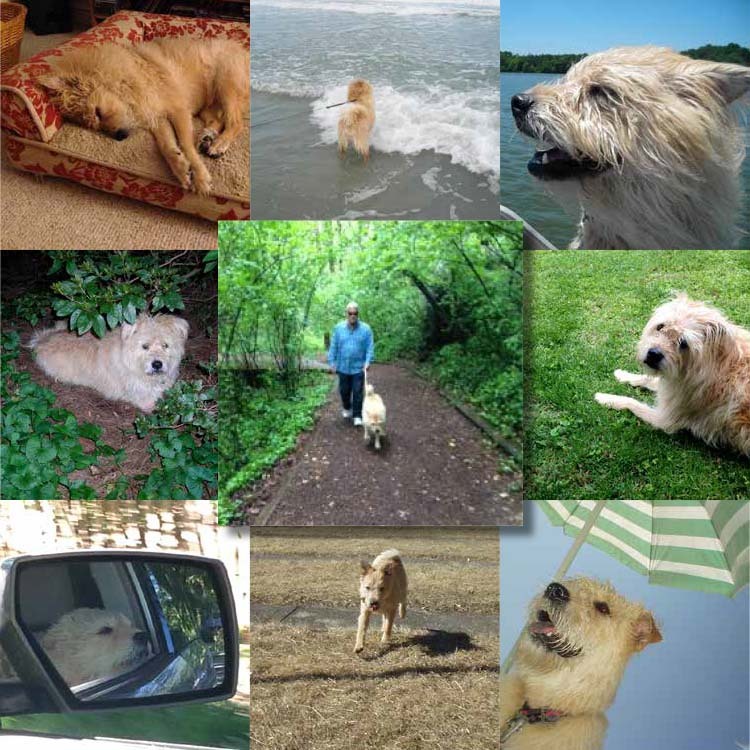 Freddie, Jimmydog’s semi-retired chief canine officer, has always had a zest for life. On one of our recent blistering hot summer days, she settled down inside with the air conditioning blasting and reflected on some of her very favorite things (aside from air conditioning, of course, because for a dog living in North Carolina that one goes without saying). If you’re a dog reader, what are your favorite things? We’d love to know! Freddie still has plenty of time to start new hobbies and try new experiences! As a dog ages, she often takes time to reflect on her life. (When we senior dogs are kind of staring off into space, that’s what we’re doing—reflecting.) Anyway, as I celebrated my 15½ birthday recently, I started thinking about all the wonderful things I’ve enjoyed over these many years. (I know! I know! I don’t look a day over 6!) I’ve been lucky to have a safe, comfortable home and the best people ever, Stephanie and Todd Belcher, looking after me. Vacations: When I first went to work for Jimmydog as chief canine officer, I insisted on lots of vacation time as part of my compensation and I recommend all working dogs do the same. Do you know the saying, “All work and no play makes Jack a dull boy”? I don’t know who Jack is, but working too much makes Freddie a cranky girl. Even in semi-retirement, I maintain a busy schedule, so I treasure my vacations. Give me a week at the beach or in the mountains and I’m a happy, happy girl. For me, vacations are a chance to check out new hotels (so many interesting smells! ), explore different trails and parks (so many things to see!) and just hang out with Stephanie and Todd (the best part!). If you haven’t booked your summer vacation yet, do it now! My backyard: In my opinion, the best backyards offer places for rest and relaxation but also provide entertainment—and by that standard, my yard is perfect. There is plenty of soft green grass to roll in, plus leafy trees and bushes to nap under. (I still visit some excellent sleeping holes my pal Joey dug years ago under the boxwoods.) But bushes aren’t just for shade: They house all the interesting critters—ground squirrels, moles, voles, rabbits. In my younger days, I took seriously my job to eradicate them from the yard. As a senior dog, I’ve adopted the philosophy of many aging hunters: It’s as interesting to watch as to kill, but that doesn’t mean I don’t ever give chase. A quick run after a ground squirrel is great exercise and exciting for all involved! The wind: My human readers might be surprised to find this on a list of favorite things, but wind is the best—oh, the smells it delivers to my nose! It’s like a news feed for dogs and I love to be well-informed! A breeze in the yard lets me know when a rabbit has hopped by, while the gust created by an open car window tells me we’re getting close to the park. Humans try it next time you’re out: Close your eyes, stretch your neck, thrust your nose into the air and take a giant sniff! You’ll learn so much. Grass: If I had to pick the best thing in nature, it would be grass. It’s so functional—perfect for peeing, for napping, for a quick roll-around. We’ve got a beautiful patch in the backyard that I use as my lifeguard stand when I’m watching over people swimming in the pool. I just wish I could explain to Stephanie why grass is so great. I love her, but she’s ruined some pretty good grass rolls over the years, insisting I have a bath after I’ve worked so hard to get the delicious smell of poop and dead stuff deep down into my fur. My bed: There’s nothing better after a walk—or after dinner or after a car ride—than a nap. I’m lucky enough to have many bedding options throughout the house, including several dog cushions, Stephanie and Todd’s mattress and pretty much any piece of furniture. These days my favorite is my dog bed in the den. It has a thick cushion and side bolsters for maximum comfort, plus a nice tan and red floral pattern that complements my fur. It is so inviting that after an especially good nap, sometimes I’ll get right back in for second one. Our van: Anyone who knows me knows I love a good car ride and these days I’m really enjoying outings in our van. Todd and I call it the “Doggy Van Gogh-Go” because we are hilarious like that. For park walks and other outings, Todd drives and I ride shotgun, window open (See No. 8: The wind). When Stephanie comes along, she’s usually polite enough to sit in the back seat so as not to mess up our well-honed driving routine. Ice water: This is a pleasure I discovered late in life. I’ve had a bit of kidney trouble (nothing too serious yet) and the vet says I need to stay hydrated. Trust me: Ice water—specifically filtered water with a handful of cubes in a nice stainless-steel bowl—is the way to go! To make it even more convenient, I’ve got bowls all over the house—outside on the patio, in the hallway, in the dining room. It’s the doggy version of people carrying a water bottle everywhere they go. Slurp! Stuffed bones: This delicacy is a Belcher pack tradition and because I like you, I’ll tell you our secret recipe. Start with large beef marrow bones—after a dog has already licked the outsides clean and gotten out all the marrow. Stuff the center of each bone with soft dog treats. Serve to your happy dog. Easy, right? I like six of these bones after dinner, served around 7 p.m. That’s correct: I said six bones. They are the perfect dessert—delicious, long-lasting, healthy for my teeth. Dog friends, feel free to share our recipe with your people. You’ll love them! Boating: Ah, the boating life! It’s like a car ride on water! Boating combines so many things I love—wind, travel, exploring, hanging out with Todd and Stephanie. My favorite place to go is High Rock Lake, with our friend Bryan (it’s always good to have a friend with a boat) and his dogs Amos and Piper. I love boating so much I wrote a whole blog about it. Read it at http://jimmydog.com/backyard/?p=1061. Walks: Of course, No. 1 is walks! I attribute my excellent health and ageless beauty to my lifelong habit of strolling. Todd and I are dedicated. We go every day, regardless of weather and average about 1½ miles. Other dogs are content walking through their neighborhoods but with my thirst for adventure, I need to explore. My hot spots are large parks—Horizons, Bethania, Triad, Miller, Tanglewood—places with wide trails, lots of woods and interesting field edges to explore. So, there you have it, friends: my top 10 favorite things. And now if you’ll excuse me, it’s time for me to enjoy No. 3!